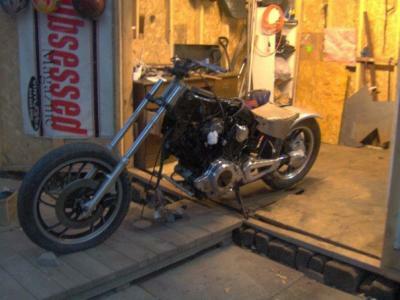 I am building the same bike check me out on facebook look for Redd Miguel and you will see pics of my virago. Yamaha Virago is unfuckable and undistructable bike . . I started out with the design and fabrication of some custom forward controls,fab of some ape hangers,custom paint and the rest just kind of fell into place.It's not finished just yet,which leads me to a question for you. Where did you run all of the wireing at the back end,that usually sits under the stock seat ? I would like to put on a bobed fender,like the one you have,but,don't know where to run the electronics. Your bike has the makings of a pretty cool chopper/bobber.